Over one full year ago, I ended my years-long boycott of Padres ownership and became a San Diego Padres season ticket holder member. I wasn’t sure that day would ever come, given the way the new ownership group started their tenure, but it did. After fielding nearly a dozen calls from the Padres, and opting not to renew, I will no longer be a Padres season ticket member. But with that comes an opportunity to provide an all-encompassing review of a San Diego Padres season ticket membership. Today, I’m reviewing one of the bigger membership perks (or so I thought): E-Cash. E-Cash, as you might have guessed, is short for electronic cash. Basically, you convert real dollars into Padres E-Cash by signing into your account on Padres.com and authorizing a third-party site to charge your credit or debit card the amount you wish to load. Last year, I believe the only allowable increments were $100 or $200. I was never charged a processing fee, so the amount that my credit card was charged each time was exactly $100 or $200. One pain point in this process, though, is the need to use an actual computer to complete the E-Cash purchase. Maybe it’s different on an Apple product, but for Android users, most web browsers were unable to access the area of Padres.com where you can reload the E-Cash card. I tried everything, by the way: view in desktop mode, the old “cached” trick … everything. At any rate, it basically meant that I had to be cognizant of my balance before leaving for the ballpark. Once I was there, I couldn’t reload my account. So why would you use E-Cash instead of just using your credit card at the game, like everyone else? Except that’s not how it really works. It might be nitpicking, but the 10% bonus certainly is not cash back. As a big bank VP for branded credit cards, I am intimately familiar with credit card reward terminology, and “cash back” does not apply to this program. The benefit is actually a 10% E-Cash credit onto your E-Cash card, which can only ever be used as E-Cash. You can’t withdraw the 10% “cash back”, nor use it to offset future payments to the Padres in any form. When you authorize the third-party to charge your credit card $200, you end up with $220 in E-Cash. The E-Cash can only be used at the ballpark. Simple enough. Using your E-Cash is another challenge. The E-Cash card is not a credit card, nor any type of card that gets swiped, but is actually the same card used at the ticket gates to access your season tickets. So you’re beholden to the Padres having the technology to read the card working at all points of time in order to use your E-Cash card to reap your “10% bonus”. But you’ll learn that not all kiosks accept E-Cash, although a large majority do, and that not all kiosks which accept E-Cash actually have the card readers working when you need it to work. And when your card can’t be read for whatever reason, you are out of luck. The vendors have no button to push to reduce prices by ten percent for season ticket members, in order to correct for when the card cannot be read. The other method is through loading the ballpark app to your phone and having the same reader scan your barcode. But the app is bulky and the card read of the phone is very finicky. I think it’s a function of the reflectivity of the phone and the design of the reader. I prefer the regular card to give myself the highest odds of using the E-Cash. I would guess that the card is usable about 90% of the time, so you actually end up with a 9% “functional discount”, not 10% cash back. Except that’s not entirely true, either! 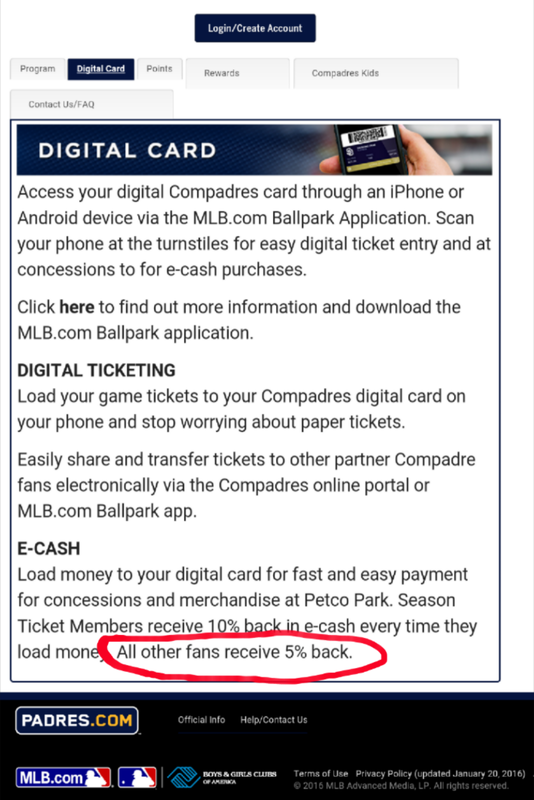 That’s because any Compadres Rewards member is eligible to sign up for Padres E-Cash and these non-season ticket members get 5% E-Cash “cash back”. So the actual season ticket member bonus is really only 5% more than what you can get without even buying season tickets. 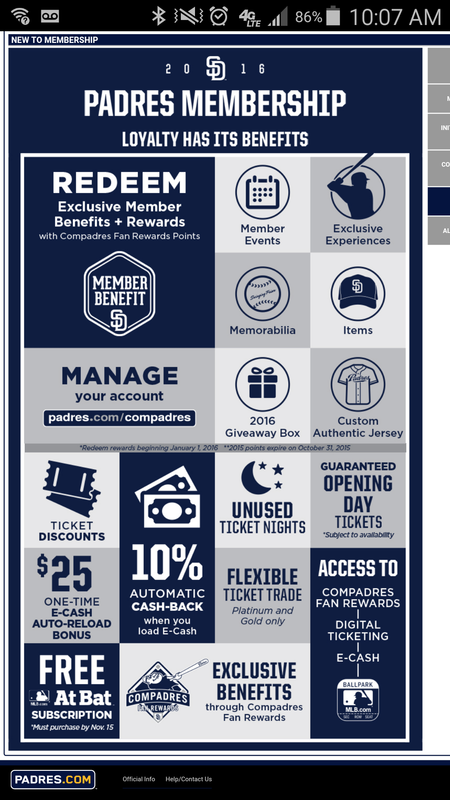 That wouldn’t be a big deal, except for the fact that the Padres basically withhold that information from their benefits list, instead listing the E-Cash bonus and Compadres Rewards bonuses as a Membership Benefit three times in the same marketing graphic. Four if you count the super large box on the top left, although that one is actually touting legitimate member benefits. It really should just have one box advertising the 5% additional E-Cash credit, and two empty boxes, since Compadres Rewards, digital ticketing, and E-Cash itself are offered to all fans. Note: the other way you can find out is by talking to Padres Jagoff. The final drawback to remember is that because you cannot convert E-Cash back into real cash, you don’t want to end the season with a balance. Letting the Padres keep the $40 of E-Cash in your account because you didn’t spend your whole balance means that you would have had wiped out your bonus on $400 in concessions. That defeats the purpose. That means that when you get towards the end of the season, you should error on the side of not reloading your card. If your have a 41 game package, that reload halt probably occurs with 3-5 games left on the schedule, or 10% of the dates in which you’d purchase concessions. So now, instead of getting 90% of your 5% incremental bonus, you’re now only getting 90% of 90% of your 5% incremental bonus: 4.05%. But besides all the shananigans, the bonus will probably extend past just you. Anyone you go to a game with can hand you cash, and you can pay with E-Cash, in order to pocket some extra dough for the two of you. That, I found, is the biggest benefit to E-Cash. So while you might only end up getting 90% of 90% of the 5% incremental season ticket member bonus, you might also be garnering friends the same 4.05% bonus by indirectly letting them use your perks. So, overall, the E-Cash program is only okay. I’d strongly prefer for the purchase price to be 10% lower when you make a purchase, contingent on season ticket member validation, rather than going through the process of loading E-Cash. 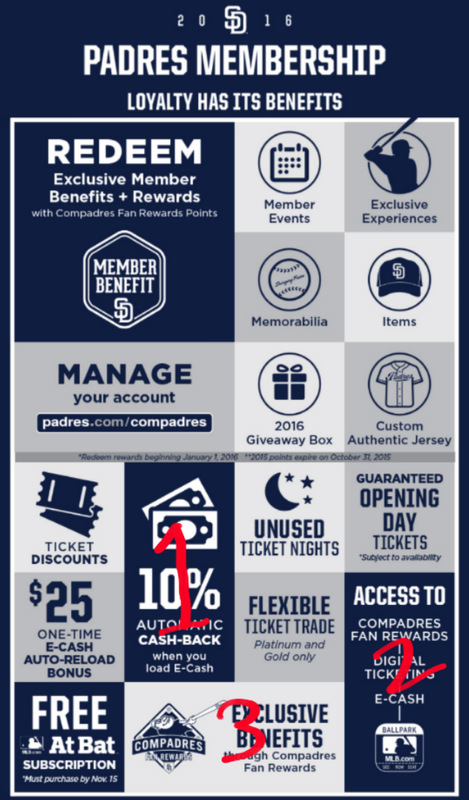 I’d also prefer for the Padres to properly represent what the program is: a small, ~4% additional perk for season ticket members – not a 10% “cash back” program. ← Booing Jedd Gyorko for making $2.5 million? FWIW, the At Bat on Android added the ability to refill E-Cash directly on the app this year. On the other hand, prior to ’15, the membership card *did* give you 10% off at registers instead of the 10% “cashback” when filling the card. Glad they added the Android feature, as that was a major flaw in 2015. Appreciate the info!